Lovely holiday home with private pool and breathtaking view overlooking Lake Garda, on the panoramic route of Bardolino, only few minutes’ walk from the lake. 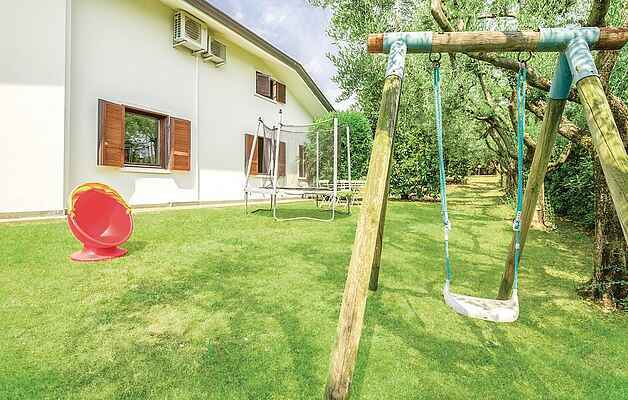 Ideal home for families with children and with pet, thanks to the fenced garden equipped with toys and doghouse. From the large terraces wonderful view over the pool and the lake. The accommodation provides fitness room, toys for children both in the garden and indoors, in the recreational room. Perfect for a stay focusing on relaxation, not far from the most renowned towns around the lake, with various services, shops, restaurants and themed fun parks. Many water sports can be practiced, along with hiking, cycling in the surrounding countryside or golf. Art towns of Verona (25Km) , Mantova (30Km) and Venice are easily reachable by car of by train from the nearby train station of Peschiera del Garda. Extra activities such as private yoga classes and massage at home, guided mountain bike tours, climbing excursions, horse rides and fishing by boat can be booked on request. The room with bunk beds is located in the basement floor and has a folding window. Approx. 3 km from the IVG353 you have IVG393 belonging to the same owner.